There are a lot of options available on the market for perfect bound bookbinding equipment. Most are expensive and geared toward companies running fulltime binderies. Others are pitched at the business market and focus on creating bound reports. There are even a few binding solutions aimed at small operations looking to create short runs of perfect bound books. But, they all cost thousands of dollars. My first experiments in bookbinding involved some extremely low-tech bookbinding tools – paint stirrers and binding clamps. It was tricky to get the pages lined up, position the stirrers, and get the clamps on (they got in the way when applying glue, too). Finally, there was no good way to add the covers. I needed a better solution. An important resource in my bookbinding journey is Nathan DeStephano’s Easy Bookbinding course. 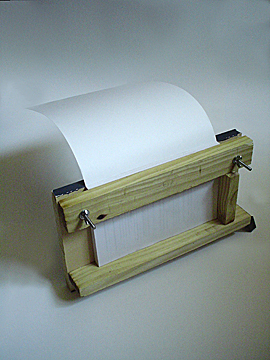 In addition to all of the information about designing, formatting, and printing books, he includes detailed instructions for a bookbinding jig that is cheap and easy to make. In my research I had seen a few similar products, such as the $135.95 version sold by GigaBooks, and decided to come up with a version of my own. The main difference between my bookbinding jig and others available is that I made mine entirely out of scrap lumber (I’m a cheap guy!!!) The whole thing cost just a few dollars for the metal hardware. The first day I tried it I made 2 books – with covers – that were much better than any others I had made previously. The pages were all properly aligned, the spines were properly compressed for gluing, and the covers fit perfectly. 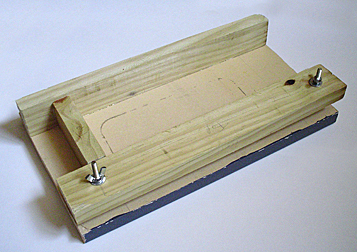 A bookbinding jig doesn’t have to be overly complicated. It’s main purpose is to provide 2 surfaces that are aligned at a 90 degree angle to make it easy to square up the pages you are gluing together (a process known as jogging), and clamping down the spine edge during gluing to keep the pages compressed together and stable as the glue is applied and dries. I made all of my critical measurements by laying a sheet of paper from a project onto the main board and tracing the edges. From there I was able to work out the placement of the page guides and the press bar. Here is a look at the jig in action as I bound my first book. The book block and cover are in the jig and the press bar is clamped down. I applied glue, folded over the cover, and let everything dry. For this test book I used 5 minute epoxy for the glue and it produced a very sturdy binding – it’s just a little difficult to work with given the fast set time. I hope these pictures provide inspiration for you as you design your own bookbinding jigs. If you are interested in a more detailed plan for how to create a jig, please leave a comment below. If there is enough interest, I’ll draft a detailed set of plans along with assembly instructions and a materials list, and maybe even put together a demonstration video to show how to assemble everything and create a book. The DIY Bookbinding Jig Special report is finally finished… Click Here and Check It Out! It would be great to have plans to build a book binding jig like the one you show in your video. Any possibility of this? I’ve also been doing more research to determine if there are improvements I can make to the basic design to make it easier and faster to use – without making it too complicated to create. If you subscribe to the email update list (upper right side of this page), you’ll get an email when new content is published. Otherwise, check back with the site or subscribe to the RSS feed to get the latest information on this site. Just what I’ve been looking for! I think I’ll try to build one this weekend. Thank you! I’m glad you like this. If you haven’t already seen my Bookbinding Demonstration Video, make sure to check it out. It shows this jig in action as I bind up a paperback. Just this morning I got an inspiration for a revised version with a few improvements. Don’t know when I’ll get access to a wood shop to build it, but the basic idea is down on paper so I won’t forget. Greetings! I made the jig and it came out great. My only problem if when I moisten the edges and apply the glue after it dries the back page is always loose when I open the book some of the pages want to break apart. Congratulations on building your own binding jig. 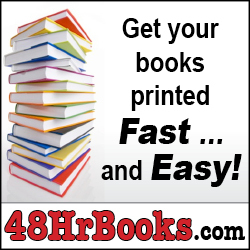 You will definitely experience an improvement in the quality of the books you are able to make. Since I wrote the first tutorial on bookbinding, I have stopped using Gorilla Glue (it’s too stiff and stains the cover paper) and also stopped wetting the book spine before applying the glue. If you are concerned about the glue adhering to the spine, get some course sandpaper or a steel brush and roughen up the paper to open up the fibers and create more gluing surface. For the past 6 or 7 books I’ve made, I switched to PowerPoxy contact cement or 5 minute epoxy. I work the glue into the paper edges before folding over the cover and the results have been excellent. Check out my Video Demonstration of How To Bind a Book to see my current process in action. One thing that might not be immediately obvious about the jig is that the depth of the paper backstop is positioned to allow the spine to stick out about 1/16″ – 1/8″ from the clamped edge so you can get the glue all the way to the edges without gluing the book to the jig (when I used the paint stirrers I was always getting bits of wood stuck to the spine that had to be trimmed away.) You could probably open up the gap even more and still get a tight spine. I’m currently in the process of writing a comprehensive revision of my bookbinding process and creating detailed plans for the jig in this article and another design I’ve been working on. The whole thing will be part of a self-published book and I plan to hand-bind, number, and autograph the first edition. I’m pretty far along in the writing and plan to publish excerpts of the book on this site as I go along. If you want to get updates on my progress and announcements when I post new articles, join the update list using the form in the upper right side of this page. Thank You for your reply and update. when I printed my book on word it printed to where I have to cut the pages ie they are not folded. will this work as well as the folded on? You shouldn’t have any problems if the spine consists of cut edges or folded edges. It is actually a little easier to press everything together for gluing with the cut edges, because the folds want to ‘puff up’. Just make sure to rough up the spine a little and work the glue in well as you apply it. I break the end off of a Q-Tip and use the stick to work the glue around. Another thing that will help is to glue the spine and apply the cover in one step so they bond well to each other. The jig makes this pretty easy to do. I would love to feature your jig and one of your books on the site. Just send me some photos and a few words describing them. Post a note here and I’ll contact you via email. I would like a more detailed draft. i think i got it. But detailed is always good. Thank you for the info. Thanks a lot mate; I built one from your demonstration. Thank you I was sick of giving lulu.com £9.95 including postage for my books. Now I’m making my own. I can’t thank you enough. 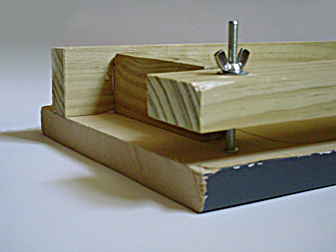 The basic binding jig is a very simple piece of equipment. There is lots of room for improvement, but it gets the job done quite well. Thanks for the really excellent site. Thinking about jig design for books of different sizes: it should not be difficult to build the jig so that shims of different thickness can be inserted along the backstop to allow for books of different width. If the jig is built an inch or two larger than is necessary for a 5.75″ width, it should be able to accommodate a variety of sizes. I’d be interested to know — preferably before I go out and build one! — whether you can think of any serious objections to this concept. Also, for taping “bare” spines when you don’t have a full wraparound cover, is surgical tape acceptable? If not, I’d be interested to know what you use. I’m having some difficulty finding the right stuff, particularly in black. Glad you like the site. One thing to do to create an adjustable binding jig is to cut slots in the base and use a wingnut and bolt to lock down a sliding backstop. Another approach is to build a jig that places a removable backstop along the spine edge. Once you get everything clamped in place, simply remove the backstop to reveal the edge of the spine for gluing. But, in all honesty, the easiest thing to do is just build a couple of jigs in the various sizes you plan to bind books in. The downside I can see for your solution is that you would have a free moving spacer that could shift around while you try to jog the pages. Not a horrible problem, but it could slow you down if you bind a lot of books. is also very good, but any fabric tape with a strong glue should do the trick. Check your local craft store in the scrapbooking section. When we get on finished I will send you a photo. Thank you again for your site great work keep it up. Can’t wait to see your results. Glad you like the site. Thanks for a great site and a wealth of information. I run an at-home-daycare and use alot of e-books for story time. Now I can print them into book-form instead of just stapling in the corner! Hopefully my darling husband will make the jig this weekend, if not, your instructions are easy enough to follow. I’m sure it’ll turn out great. This is awesome that you will be using these techniques to put together story books for the kids! Please send me a picture of some of your finished books in action, I’d love to post them on the site! Hi as soon as I’ve got them ready I’ll send a few pics. I’m doing a lot of work right now with an author who is self-publishing a novel for the youth/comic book crowd. He’s going to have a commercial printer create the books for him, but I’m helping him with the marketing and promotion side of things. In the near future I’ll be adding some interviews about the writing process he used to get his manuscript written and edited, and also some articles about what we did to promote the book and how it worked out. It’s pretty exciting to be a part of it all and I hope that others here will find value in this aspect of the do-it-yourselfer process. Sign-up for the update list if you’d like to be notified when new content gets posted on the site. Thanks for this informative material. I hope to self-publish a funny short paperback for boys about age 10 using PagePlus X3 software for layout and a self-made jig for binding. Anyone had experience using PagePlus for a book layout? Just discovered this site. I use a similar jig for my books, but I have two holddowns and a hinge: jog it up while horizontal and clamp the pages a good distance away from the spine (say, three inches), and then flip the thing upright so that the spine is on top; at that point you push against one side of the book, so that the spine shifts to the side (i.e., towards the front or back of the book), before applying glue; then push it back in the other direction and spread the glue evenly; a couple more back-and-forths, and then let the book stand straight and apply the outer clamp (near the spine). That fixes the pages considerably better than applying glue to clamped-together pages. Another trick I use is to apply a piece of soft cotton cloth to the glued-up spine (let it overhang; you can trim it back later; or, if you’re making a hardcover book, glue it inside the cover to provide more strength) – I can open my books right out flat, or even bend them backwards, without pages coming out: much better than store-bought paperbacks. I’ve seen similar jigs demonstrated, but haven’t felt the need to go the extra step. If I were strictly using PVA glue, I would strongly consider the approach you described. The main reason I clamp the pages close to the edge is that I nearly always use folded 4 page signatures for my books rather than cutting the pages down before printing and binding. This means that the spine edge tends to ‘puff up’ a little and the close clamping keeps my spines tight. When I do use PVA, I loosen the clamp bar after jogging the pages, apply glue, then clamp and apply a second layer of glue. This isn’t as effective as the fanned edge gluing you described, but it lets the glue work around the edge of the pages a bit more for a better bond. Thanks for sharing your experiences. Every bit of information and experience helps. I’m glad you found the article helpful with getting your books bound. The chances of me making my way to Jakarta anytime soon are pretty small, so why not find a local writer to treat to a latte in my honor? I’d like that! Two short questions: I notice that your paper is in signatures; do you need to do this cause I’m wanting to bind my own thesis so preferably I just want to print straight to A4 standard page and apply the glue to that end. Will it still work without having the fold of those signatures, on single sheets? And second I notice your jig sits flush with the spline; I’ve seen others that don’t, having the spin protrude a little. Is it necessary to have it completely flush with the end of the jig? It won’t make any difference if you print straight to A4 rather than using folded signatures. It will actually be a little easier to get a nice even spine using single sheets. My binding jig actually lets a small bit of the spine protrude to keep the glue from sticking to the jig. I keep the edge close in order to better compress the folded signatures and give me a nice spine. Otherwise, the folded edges would expand too much. Thanks for posting that video on book binding! It’s really helpful. I’m glad you liked the video and found it helpful. In a few weeks I’ll be leaving the world of fulltime employment (got laid off – but it’s a good thing.) As a result, my work will now be focused on my online publishing and that includes this site. So, look for a new site design, new articles, and some new videos on this site. And, if there is something you want to see here in the future, leave a comment and make a request. About to get my hubby to make this jig.. its great.. If you have any questions or suggestions, please leave a comment. It would be MOST wonderful if you put out detailed instructions for the jig (which from the above comments it looks like you are going to do), I am going to need to make this jig myself, as my hubby is a ‘computer guy’. So as my time is limited (just had my 5th baby), having blueprints instead of trying to ‘figure it out’ from the picture would be GREAT!!! I will be using the jig and your wonderful video presentation for my childrens homeschooling. It will be MUCH more fun to let the children ‘bind’ their own books after we write and illistrate them rather than the ‘staple it down the fold’ method we have been using! please let me know as soon as you have the blueprints and supply list available!!! I’ve just made the jump (thanks to a job layoff) to fulltime self-employment. Add in 2 small children and a major relocation of the family, and I’m struggling to find the time to get projects done myself. When I made my jig I didn’t make a single measurement. I just took a piece of paper the size of the book I planned to make, and laid it on the base board with the spine edge hanging off a little bit. Then I traced around it with a pencil. I cut a few strips of lumber for the guides and glued them down using the pencil marks as a guide. It’s not a precision piece of equipment. Close enough is okay. Your project sounds awesome. When my kids are a little older I plan to do something similar. I came across your web site looking for a simple cost effective method of perfect binding. Your site has provided a lot of insight I have a project due and well I’ll make my dead line thanks to you. I’ll be going to my local hardware store soon so I can make my own jig. Thanks and I hope you do display the Diagram on how to make the Jig a lot of people will find it useful. Glad you were able to use the information here to get your project done. 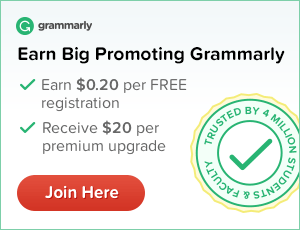 Im sure you already know how great your posts are! But just let me reminde you again how great and forward they are. Im going to begin binding my own books and would just like to know if there are any adjustment to or for the jig or tips i should know for binging hardcover books? Most if not all the sites ive been running into are for paper. So if theres any you might know plez do share. Also could you give the measurments that you used for your jig? They would really help a ton! Keep up on the great book binding im so happy i found your post i almost bought a 235.00 glue kit, Thank you! I cant wait to get started on my first binding!! I came across your bookbinding on youtube. 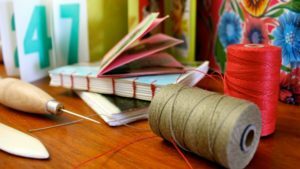 I had googled bookbinding sites because I teach second graders, and I would love to make some of my students’ creative stories special for them by binding them into book form. They would be so so excited, and I know this would encourage them further in excitement of writing! I want my husband to make me the bookbinding jig you have pictured, so your measurements of the constructed pieces of wood, etc. would be great to have. I’ve just told him of your great method of binding pages for books. I’m too excited to try this. If you have measurements for your jig already posted on the net somewhere, would you please let me know where. Thanks so very much for sharing your know how! I would LOVE if there would be a plan and detailed explanation of how to make the bookbinding jig! Please let me know if there is a way to get it! THank you a lot for your video and tips! I don’t know anything about binding books, but I do however know a bit about building things. My girlfriend wants me to make this jig for her because the non-profit organization that she is co-directer of is in need of one. This has been a lot of help, however, I’m in need of a little more. I’ve come across this site on book binding and saw this jig….i think that the blueprints and video instruction would be good….at least it would saved us time figuring it out….I like that jig since it can keep everything straight and proper and quite effective. I can’t wait to start making my own book binding jig. if these measurements and instruction in making is available elsewhere on the net, do let me know about it. Thanks a lot and have a nice day. I have came across two or three of these tutorials and only one with detailed schematics of how to build the jig. Unfortunately, it is only two narrow pieces of wood blocks with the wing nuts to clamp them down. I like the jig that has the wood insert in order to keep the pages together. I noticed that it has been two years since the promise of a detailed DIY jig building instructions and wondering how much longer do we have to wait, lol. Thanks a bunch and in anticipation. Thanks. Hi – I am making my first book for a class and wondered – Do you have to use folded pages or can you just glue loose ones to the cover? There is no reason why you can’t use loose pages. I use folded 4 page signatures because it produces finished books at the size I want and reduces the amount of cutting I have to do. If you don’t have it already, check out the detailed report I put together showing how to make a jig of your own. Why do old books that are glued together fall apart at the binding? Doesn’t the binding become brittle and break. What do you think would be the lifespan of your binding in decades? What glue might prolong the lifespan or durability of a book bound in this way? Excellent site, by the way. You are amazing. JUst wondering if you could help me convert your book binding jig measurements to fit an A5 piece of paper instead of letter size? p.s. I just purchased your pdf ! While perfect bound books are not intended to be archival quality, the choice of glue will have a huge impact on the long-term durability of the book. I’ve got a number of books that are 5-7 years old and the bindings are doing fine. They should easily last 10-20 years without any problems. After that long, though, even commercial paperbacks begin to have problems. If you are looking to create a book that will last for centuries, plan to do a sewn binding. It will be much more labor intensive, but the resulting binding will last a long time. As far as dealing with the thickness of the folded pages on the spine, that’s what the jig is for. I stack the pages of the book block and use a bone folder to create a nice hard fold. Then I load everything into the jig and clamp it all down. The spine compresses to nearly the same thickness as the rest of the pages. And, when the glue sets, the thickness holds just fine. You can always pre-trim the pages before printing (or use a stack cutter to cut the spine edge before gluing.) But, I don’t see much benefit in going through those extra steps. My measuring technique for creating the jig is extremely low-tech. Next, hold the paper in place with one hand and trace the edges of the paper with pencil onto the baseboard. When you glue down the side stop and back stop, use these pencil lines to align the edges. That’s how I made mine and it should work just fine for your jig. Sorry I didn’t have a more prompt reply for you. I’ve been away from the site a bit recently. This response is probably too late. It is very possible to do a glue binding on tabloid size pages if you create a customized version of the binding jig I show on the site. It’ll be a but cumbersome to put together, but it’ll work. The resulting books would be pretty floppy – I imagine you’ll need to come up with a large format hard cover as well to give it some stiffness. I was hoping to order the guide to build the jig, but alas, I do not own a kindle. How would I go about getting either a pdf version or a hardcopy version? P.S. You don’t need a Kindle Reader device to read Kindle books. Amazon offers free Kindle reader software for Mac, PC, Android, iPad, and Nook. I have an Android tablet and get my Kindle books through a free reader app. Thanks Carry on, I’m glad to have such tutorial. Is there some way that I could buy your used book binder jig? I would make one but I don’t have the tools. I want one very badly and can’t find a business to sell one. At the moment, I don’t have the ability to build jigs for sale. If I could, I would because I get a number of requests for ordering binding jigs.